Be the first to share your favorite memory, photo or story of Twila. This memorial page is dedicated for family, friends and future generations to celebrate the life of their loved one. Twila “Coleen” Miller died on Sunday, March 24, 2019 at Morningstar Care Home in Fredonia. She was born January 6, 1939 to Clarence and Lois (Hines) Babcock in Thayer, Kansas. She was raised on several farms throughout the area and graduated from Altoona High School in 1957. After graduation she married Bobbie Miller. They later divorced, and he proceeded her in death on July 28, 1982. Together they had four children: Kevin (Melissa) Miller of Chanute; Cheryl (Robert) Harding of rural Fredonia; Twila (Bill) Clinesmith of Buffalo, and Kayla (Mike) Joy of Wichita. Coleen also had ten grandchildren and twelve great grandchildren. She is also survived by a brother, Clinton Babcock (Carol) of Lansing, Kansas, brothers in law John Parker of Fredonia and Oren Patterson of Chanute, and many nieces and nephews. She was proceeded in death by her parents, brothers Wayne and Eugene Babcock, and sisters Vivian Parker, and Darlene Patterson. Coleen worked at Self Service Grocery store for many years. When it closed she began working at Fredonia Regional Hospital from which she retired in 2003. She also was a representative for Home Interiors and Gifts for over 25 years. 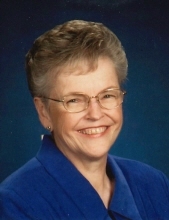 She was an active member of the First United Methodist Church where she was involved in the United Methodist Women, served as kitchen chairperson, organized communion preparation, and worked in the nursery for numerous years. She was also member of the Fredonia Regional Hospital Auxiliary. Coleen was known for her baking (especially crescent rolls), sewing, creating beautiful embroidery work, and her love and pride for her family. Her family would like to thank the staff at Morningstar Care Homes who provided exceptional care for their Mother and Grandmother for the last two years as well as Hometown Homehealth & Hospice. Funeral Services will be held Wednesday, March 27 at 10:30 am at the First United Methodist Church in Fredonia. The family will receive friends Tuesday, March 26 from 5 to 7 pm at Wickham Family Funeral Home. Memorial remembrances are suggested to the First United Methodist Church Sprigs and Sprouts program and may be left or mailed to Wickham Family Funeral Home, 510 North 7th, Fredonia, KS 66736. To send flowers or a remembrance gift to the family of Twila Coleen Miller, please visit our Tribute Store. "Email Address" would like to share the life celebration of Twila Coleen Miller. Click on the "link" to go to share a favorite memory or leave a condolence message for the family.